Who can record the meeting? By default, only the host can record the Zoom meeting. However, the host can choose to give other meeting participants the ability to record. To do this, the host will need to click on the “Manage Participants” icon on the Zoom menu bar, and click on the “More” tab to the right of the participant’s name. 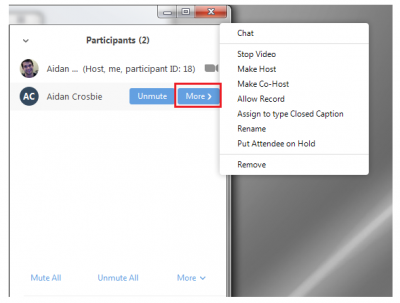 Then select “Allow Record” to give the participant permission to record the meeting. Note: If you are recording a meeting in an advanced classroom or auditorium, please contact AV Services to discuss your recording options. Click on the meeting link. Join the meeting audio either through telephone or computer audio in order to record the meeting’s audio. Once you have connected to the Zoom meeting, move your mouse around the screen to display the menu bar shown below. All participants in the meeting will see a recording indicator in the upper-left corner of their screen. To stop the recording, click the white square. To pause the recording, click the pause icon. Due to space limitation, Gillings Cloud Recorded files are stored for a limited time and can be accessed for up to only 30 days. At that time, your recorded file will be automatically deleted. If needed, please download an archival copy as soon as possible. Alerts and reminders will NOT be sent to users. Also, please note that links to Zoom Cloud Recordings are PUBLIC and are NOT password protected by default. Anyone with the view link to the video can view it. To request Cloud Recording Access be added to your account, please complete the Gillings Zoom Cloud Recording Request Form. Note: Once the recording has been stopped, the recording must be processed before viewing. Zoom will send an email to the host email address when the process is completed. Can I make multiple recordings in the same meeting? Yes. You can stop and restart recordings as many times as you’d like. Separate files will be created for each recording. You can also pause the recording and resume recording when you are ready. You can choose to record in Active Speaker mode (current speaker fills the frame) or Gallery View (multiple participants seen on screen at the same time). If content is being shared by a meeting participant, the view will switch to Content Sharing with Active Speaker. In this mode, the slides or content will fill the screen and you will see a picture in picture window of the active speaker. The Zoom meeting will be recorded in the layout that the person recording is currently viewing. For example, if the host is recording in Gallery View, the recording will be in gallery view. This is independent of what the participants are viewing. If a participant is watching the meeting in active speaker view and they start recording because the host granted them recording permission, the resulting recording will be in Active Speaker. What is the format of the recorded file(s)? A MP4 video file, a M4A audio file and a M3U playlist file will be generated by the recording. If the chat function was used during the recording, a .txt file of the chat dialogue will also be created. Access your recorded meeting by logging into your Zoom account and navigating to My Recordings. Note: If your meeting has not finished converting, the recording will show in the list and you will see a message of “Processing Recording…”. Once the recording has finished converting, you will be able to view, share, download or delete your cloud recording. Click the meeting Topic to display the available file types of the recorded data, based on the settings you have enabled. Click a file to play the recording or see the text of the chat. You can also download a file to your computer, share a link of the recording with others, or delete a file. How large are the recorded video files? Screen sharing recording would take about 20M of storage per hour while video recording would take about 200M of storage an hour. This is an estimation as the resolution and types of video or screen sharing content could change the storage requirements. Can I upload the recorded file into Sakai? Login to Sakai, go to your site, and click on “Site Info”. Click on the “Manage Tools” button. Find Warpwire near the bottom of the tool list and check it. Click “Continue” and then “Finish”. Warpwire will now appear at the bottom of your site navigation list. You can move it higher by clicking “Site Info” -> “Tool Order”. Now you can click on the Warpwire button to begin uploading video files. Click on the Warpwire button in your site navigation. Click the “Upload files from your computer” button. In the File Upload window, find the location of the video file you want to upload and select it. Note: If you are uploading Zoom recordings from a PC, these will be located in your Documents folder, in a Zoom folder (C:\Users\[your user id]\Documents\Zoom). Zoom recordings will produce both an audio-only file (in M4A format), and a full video file (in MP4 format). You can upload either, or both. The upload will begin processing. Once it is done, your students will be able to access the video through the Warpwire button. See the Warpwire demo video below if you would like to add video to other areas of your Sakai site.